Skill Evaluation Academic Edition is a Test Management Software to create and conduct computer based online examination. It is a most powerful user friendly test generator, exam generator educational software available in the academic market at affordable price. 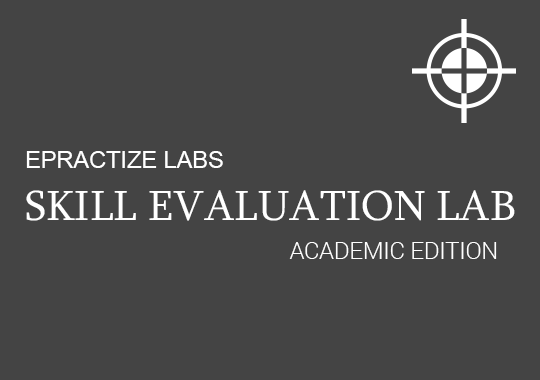 What is Skill Evaluation Lab? Computer Assessment Test (CAT) management system suitable for all kinds of exams including web based university or college exams. The product can evaluate and score results for all Skill Evaluation Lab type questions except descriptive type questions where candidates can write answers from web doc or from web image writer, can also record voice answers (suitable for web interview or visually challenged candidates). The descriptive question answers should be evaluated manually by viewing examinee’s answers. The product solution can completely replace any kind of paper based exams into web based exams. No more papers; a small initiate towards saving the environment.online test software product tourSkill Evaluation Lab Take a Fee TrialSkill Evaluation Corporate Edition is a Test Management Software to create and conduct computer based online examination. It is a most powerful user friendly test generator, exam generator educational software available in the academic market at affordable price. Role based access to match with real-life users. Skill Evaluation Lab comes with 6 different roles to match with real-life users to perform global settings, exam management, taking exams,taking trainings, viewing reports and printing question papers for traditional paper based exams. User and Group Management. Users can be grouped to specific category for exam association and reporting. Generate reports under group level for ranking or appreciation. Test and Question Management. Easily create your own tests with single choice, multiple choice, single text, match the right choice and descriptive questions. Load questions from XL spreadsheet, Word Documents or from question editor within the product. 6 different question types to test any kind of skills, which includes custom type question, where a question can be designed with any number of fill-in answers and combo-box selection answers. Question with any kind of attachments. A question can have images, flash files, videos or any HTML attached contents can be either directly embedded or uploaded to server. You can also create voice questions directly on your desktop head phone. Multi-language support. Create questions in any language with image, videos and flash files. You can directly copy and paste from other sources. Auto evaluation and manual evaluation questions. The product can evaluate and score results for all Skill Evaluation Lab type questions except descriptive type questions where candidates can write answers from web doc or from web image writer, can also record voice answers (suitable for web interview or visually challenged candidates). The descriptive question answers needs to be evaluated manually by viewing examinee’s answers. The product solution can completely replace any kind of paper based exams into web based exams. No more papers; good news for saving trees. Test Monitor to unlock user and enable test session. The product will not allow an examinee to use the same login credentials for concurrent login attempts. The test session also unique to the examinee and they cannot re-take the same test without exam manager’s approval. Scalability and performance. Can scale up to any number of concurrent users even in the case of non-cloud environments. Leverages the benefits of Java EE EJB components. Tested on client’s environment with 2000 concurrent users on Windows 2000 Server (with 3 GB RAM). Technology and environment. The product can be deployed on local or remote server. 100% open source platform and no commercial license required for running this application. The product requires Java EE 4 or above enabled JBoss application server and MySQL database. Improves Overall college/school results by using this powerful Skill Evaluation system. Measure overall weak areas and focus more on training those areas. Cut-down your training cost by Skill Evaluation Lab practice exams. Move from traditional paper based exams to next generation computer based exams. Track candidates/faculties skill level and improve.